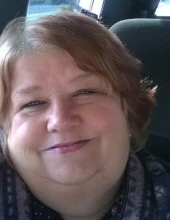 Lydia A. Bradley, age 61, of Knox, passed away Friday, March 22, 2019. She was born September 14, 1957 in LaPorte, Indiana to Bill and Charlene Young Hudson. She had worked for many years at the Scott-Foresman Company. On November 10, 2010 she married Roy Bradley, he survives. Also surviving are her father, Bill Hudson of Missouri, her children, Jonmichael Koekenberg of Owensboro, Kentucky and Gretchen Koekenberg of Marion, Indiana, step-children, Ann Bradley of Colorado, Matt Bradley of Knox, and Dewayne Bradley of Knox, a sister, Penny McDowell of LaPorte, 7 grandchildren and 4 great grandchildren. A funeral service will take place at 7:00pm (CT) Tuesday, March 26, 2019, with visitation 3 hours prior to services, at M.C. Smith Funeral Home. To send flowers or a remembrance gift to the family of Lydia A. Bradley, please visit our Tribute Store. "Email Address" would like to share the life celebration of Lydia A. Bradley. Click on the "link" to go to share a favorite memory or leave a condolence message for the family.